David Chang of Momofuku fame recently spent two day in the kitchen at St John Hotel. 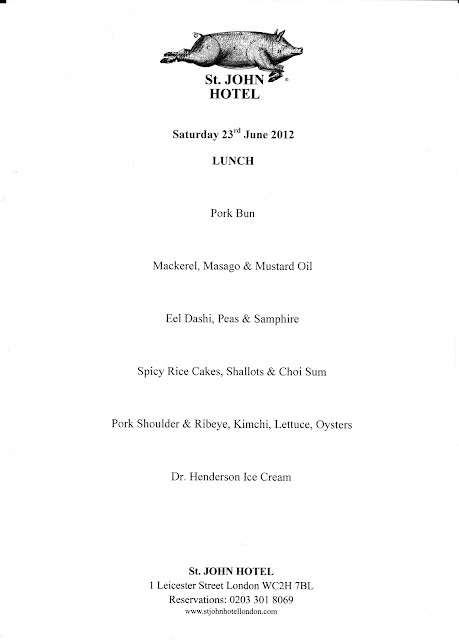 We found about this event serendipitously, when I happened to see Tim Anderson (2011 Masterchef winner) tweet that he had a reservation. After a swift email, a stressful wait for a reply, and a some to-ing and fro-ing on time slots, we secured a booking and the deposit was paid. Not cheap at £100 per head (before drinks and service), but this was a one off, and we had both regretted not paying Momofuku a visit during our trip to New York a couple of years ago. Moist, juicy thick slices of belly pork encased in a soft steamed bun. Accompanied by a dish of chicharron - fried pork skin. Not being a fan of crackling or scratchings it was inevitable that I wouldn't be overwhelmed by these, but Sam loved them. 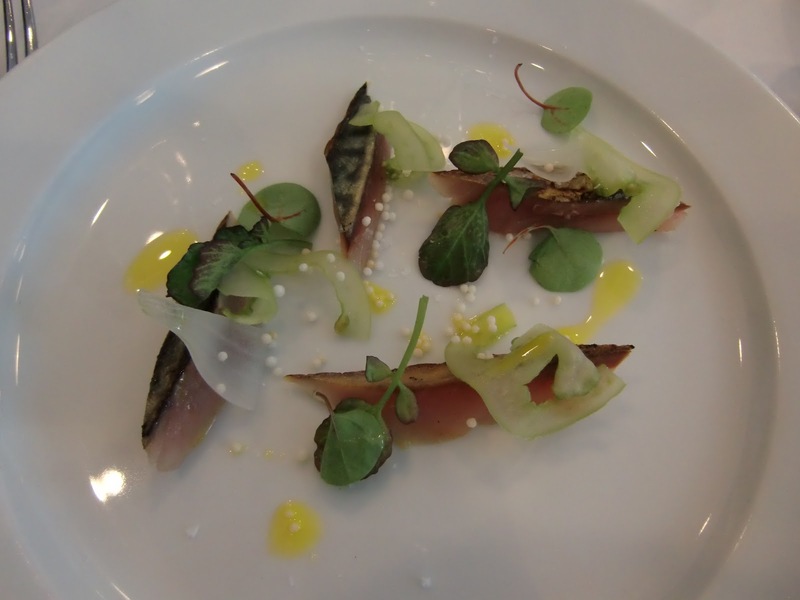 Seared mackerel, shoots and mustard oil. The white dots are made from cod roe - we weren't sure how they'd been prepared, as they were toasty and crispy in texture. A heavily smoke-scented and flavoured dish, presumably coming from the smoked eel. 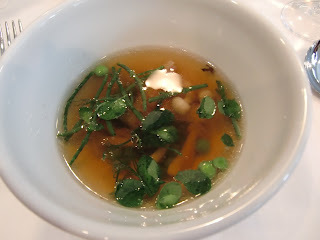 The dashi was salty and incredibly savoury, with the samphire and enoki mushrooms adding to this, then the fresh peas and pea shoots added a freshness and really lifted the flavour. This was served with a choux bun filled with eel scented cream and an apple gel which again lifted and freshened the flavour. 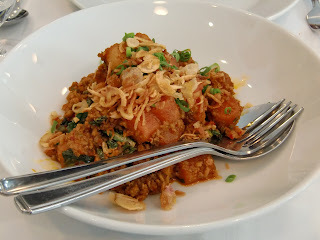 Probably our favourite dish of the meal - incredibly spicy and moreish, rice cakes cooked in a pork sausage ragu (for want of a better word), topped with crispy shallots. 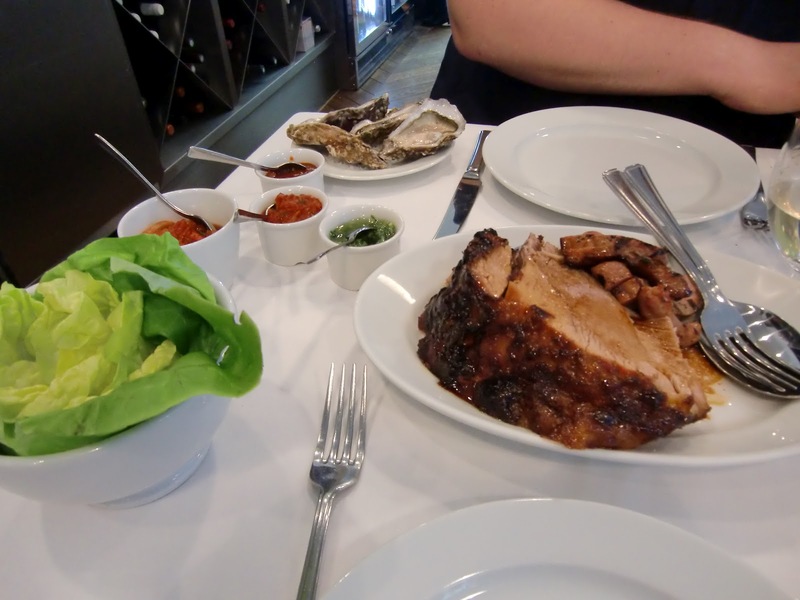 Pork shoulder and rib eye, served with the usual ssam accompaniments of rice, ssam sauce, kimchi and a surprising addition of oysters. The ribeye was delicious - a first for me - very moist, with an interesting texture, and an intense porky flavour. Sadly the rice was quite dry and we suspected not freshly cooked. 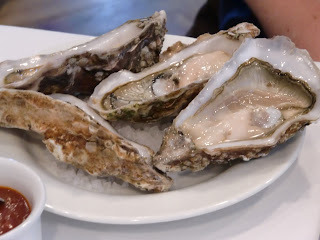 I really wish I liked or could even stomach oysters, as I often feel I'm missing out. I couldn't bring myself to try one, but Sam did, and I'll be honest - the look on his face made me think I'd made the right decision. Whereas Sam is brave enough to try and train himself to like them, I'm afraid I'm just a wimp. 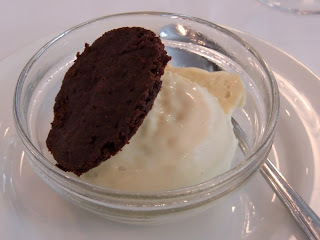 The final course, and the only way I can describe the flavour of Dr Henderson ice cream is, well, strange. Possibly an acquired taste it incorporates the much maligned liqueur Creme de Menthe, and the bitter Fernet Branca. Having said that it was strangely tasty and the chocolate brownie-like biscuit served with it was delicious, I'd love the recipe. Overall, a very enjoyable meal, if a bit over-priced - I had expected a few more 'luxury' ingredients given what we paid for the meal. A couple of minor niggles regarding the service - aperitifs arrived halfway through the first course rather than before the food started arriving, the dessert was brought to the table whilst I was in the loo, and the most unforgivable of all - the waiter who brought us post-dinner drinks tried to fob us off with madiera rather than the port we'd ordered, claiming it was 'almost the same'.....hmm. Having eaten at St John and St John Bread and Wine previously I'd say this is my least favourite of the three ambiance-wise - it has a canteen-like feel and was very noisy when full. Apart from the points I have mentioned above though the service was professional, friendly and attentive, and the food was incredibly good. The portions were big and we had plenty of uneaten pork shoulder leftover, which was packaged up for us to take home - it made a superb lunch the following day. 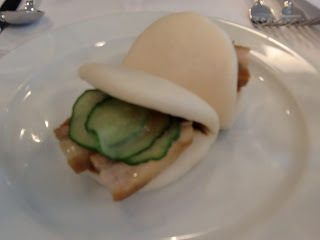 Should we manage to take another trip to New York anytime soon we will definitely be paying Momofuku a visit.